There have been a lot of exciting advances in feeding tube technology in the past decade or so that has been a great blessing for people in need of nutritional support. Percutaneous endoscopic gastrostomy (PEG) tube it the most commonly used weapon in the battle to provide nutrition for nursing home patients. It’s cheap, relatively painless, and is less intrusive for patients. The PEG provides feeding directly into the gastrointestinal tract. A feeding tube goes directly through the abdominal wall into the stomach. It is critical that the tube remain stable, so there is usually a little internal bumper to keep it from moving back and forth. It stays in that position and you administer some sort of liquid feeding and/or medicines through the tube. Many feeding tube complications are the result of human error. This happens in doctor’s offices, hospitals, and nursing homes. If you or a loved one has been injured or killed, as the result of an error involving a feeding tube, you can get a free, on-line case review. We can help you understand and explore your options. Receiving a free, on-line case review does not commit you to do anything and it does not cost you a penny. Like any procedure, feeding tubes come with risks. Doctors, nurses, and nursing home staff must keep a lookout for complications. These risks include infections, including deadly necrotizing fasciitis, which is a known complication which develops from the leakage of feedings and medicine from displaced PEG tubes. Sepsis is another big risk. The standard of care requires hospitals and nursing homes to stop the tube feedings, if a problem with the PEG tube occurs. 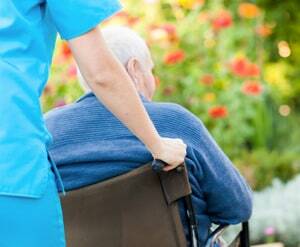 The signs of problems are easy to spot, if the nursing home staff is paying attention. Often vomiting, excessive residuals, abdominal distension or pain, or leakage around the PEG tube site is an indication of a problem. When this happens, the nursing home staff must report these findings to the nurse; who more than likely will need to involve a doctor to get the appropriate orders. Typically, this will require an ascertainment of proper positioning of the PEG tube. But, this has to be figured out quickly. It is incumbent to find out where the PEG tube - or even if the PEG tube is in the right location. If the problems are never brought to the nurses or doctors’ attention - negligence comes into play; which gives rise to a lawsuit. When the information eventually gets to a doctor; the standard of care requires that the doctor assess and conduct a thorough examination of the patient’s signs and symptoms. They must stop the use of the PEG tube feedings when there is evidence of leakage, infection or other adverse reaction, and make sure the problem is fully explored. This often requires a CT scan to determine that the PEG tube is in place and safe to use. There are also sometimes claims against the radiologist for misreading the CT and not seeing that the feeding tube was dislodged. Insertion PEG feeding tubes have a very low rate of complication, estimated at .1% and 1%. But malpractice cases do arise with PEG tube errors, during surgery. The standard of care for a surgeon demands the doctor to make sure that the PEG tube was actually placed into the stomach and properly secured and affixed. This is critical because if the PEG tube is dislodged or moves, the spillage is not going to be nutritional and it will potentially injure the patient. The contents can often spill into the peritoneal cavity or even the lungs. Another big mistake is when the surgeon inserts the tube into the intestine or colon, instead of the stomach. This is another reason why doctors must verify with a CT scan after the tube has been placed. Surgeons also need to make sure when they do make an error, they identify and fix the problem. Sometimes, the medical malpractice claims is not the mistake, because the mistake could have been fixed if identified and solved. Peg tube malpractice claims can arise from post-surgical when moving of the patient. The standard of care for nurses and nursing personnel requires that a patient with a PEG tube be repositioned or be transferred in such a way that the PEG tube does not become dislodged. Again, sometimes the real negligence here is the failing to bring the mistake to the doctor’s attention to get the problem resolved. Rather than calling a doctor when the tube becomes dislodged, the nurse or nurse’s assistant will just push it back in the patient’s body or tape it down. If you believe you or a loved one has been the victim of medical malpractice in the Baltimore-Washington, D.C. area, call us today at 800-553-8082. If you are outside of the Maryland-D.C. area and are looking for a lawyer in a feeding tube negligence case, reach out to us on-line and we might be able to assist you.